Fenerbahce Ulker survived a tough test on the road to beat Union Olimpija Ljubljana 75-81 at Stozice Arena in the Slovenian capital and improve to 2-0 in Group A of the Turkish Airlines Euroleague. Fenerbahce never was able to pull away from the gritty Olimpija side, which dropped to 1-1 in the group. Bo McCalebb led all scorers with 17 points, but missed most of the fourth quarter with an ankle injury. 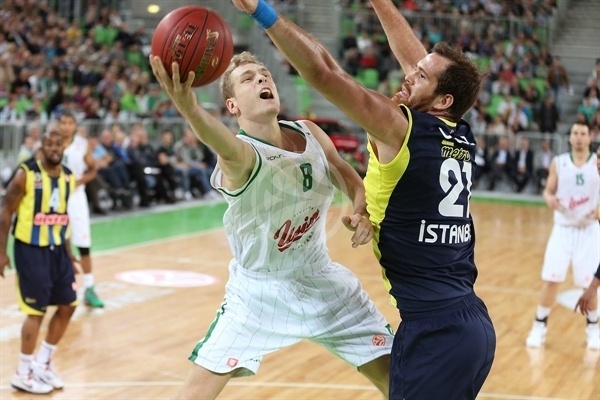 Bojan Bogdanovic scored 11 of his 14 points in the first quarter while Omer Onan and Mike Batiste both added 13 points for Fenerbahce, which was outrebounded 40-29, including 16 offensive rebounds by Ljubljana. 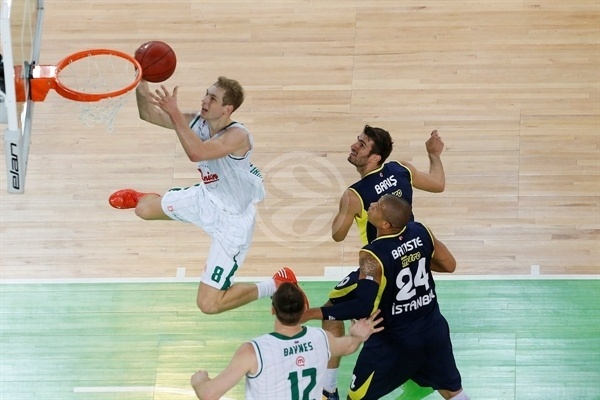 But Olimpija shot just 39 percent overall from the field and could not make up the difference. Aron Baynes had 14 points and 12 rebounds while Klemen Prepelic scored 13 points and Dylan Page added 10 points for the home side. While Olimpija had the same starting five from their season-opener, Fenerbahce made one change to the starting lineup with Bogdanovic filling in for Romain Sato, who was not available for the game. Mike Batiste opened the scoring for the guests with a straight on three-ball. 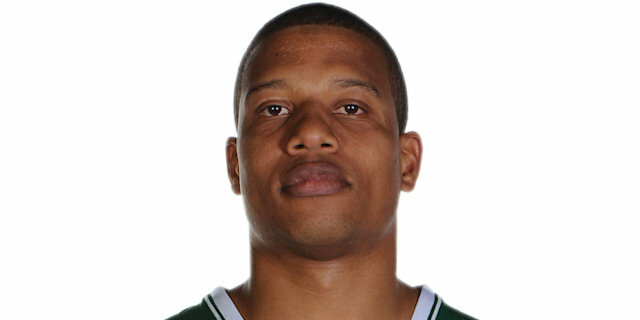 Dominic Waters put Olimpija on the board with a jumper. 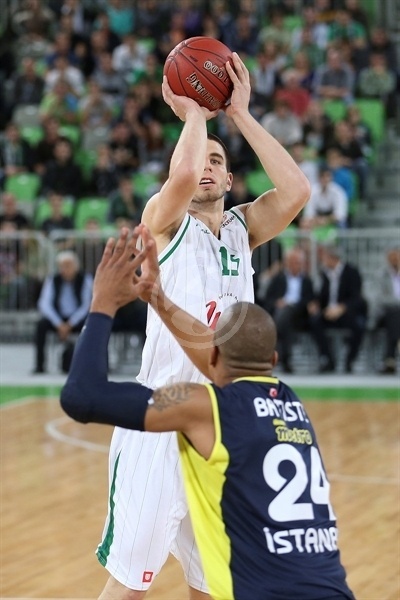 Baynes started strong with a tip-in before Bogdanovic and Page swapped three-pointers for a 7-6 Olimpija lead. McCalebb scored his first points with a layup after a great crossover dribble for the Turkish team. Union scored six straight points, including a Sasu Salin layup off a Baynes assist and a Baynes inside basket for a 13-8 lead. McCalebb got into the paint for a score, Batiste picked up a cherry-picking dunk and Onan nailed a three-ball before Bogdanovic’s layup completed the 0-8 answer run by Ulker. 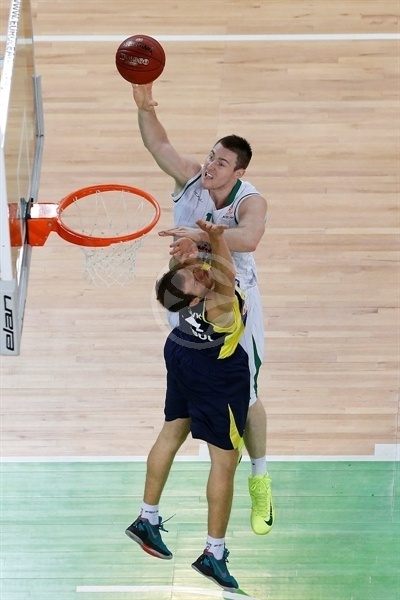 Baynes continued to give Fenerbahce fits in the low blocks with a tip-in basket to trim the margin to 15-17. Bogdanovic nailed a long three-ball and McCalebb again raced past his defender for a layup for a 15-22 Fenerbahce cushion. Teemu Rannikko’s free throws and a basket by Drazen Bubnic had Olimpija within 19-23. Bogdanovic hit two more free throws and the gap was 20-25 after one quarter. Ilkan Karaman came off the bench for a three-ball to start the second quarter to make it 20-28. Dino Muric answered by tipping in his own miss and Rannikko drained a three-pointer to trim the deficit to 25-28. Batiste quieted the crowd temporarily with a jump hook and Emir Preldzic streaked in for a layup for a 27-32 lead. Baynes came back with a layin after a fine pass and Blazic raced in for a layup though he missed a chance to even the game by missing the and-one foul shot as Olimpija was within 31-32. Preldzic answered with four straight points on a free throw and a triple from the left side as Fenerbahce was ahead 31-36. A Batiste jumper and McCalebb foul shot pushed the cushion to six points, 33-39. Olimpija would not go away with Prepelic making two free throws and Page hitting a shot off the glass to pull within 39-41. Olimpija coach Saso Filipovski watched as Baynes picked up his third foul late in the second quarter. Despite Batiste making two free throws to make it 39-43, Salin nailed a three-pointer from the left wing with 24 seconds left to even the game at 43-43 and Prepelic drained a triple from the right wing at the buzzer to give the home team a 46-43 lead at the break. Baynes started the second half on the bench and Alen Omic put back an offensive rebound to open the third quarter. 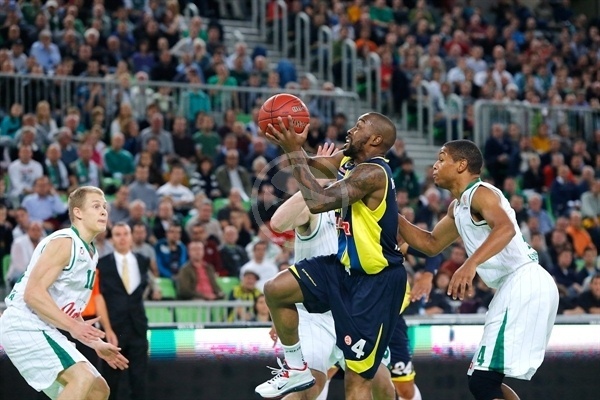 McCalebb hit a floater for Fenerbahce’s first basket. Waters knocked down a jumper to re-establish a five-point lead, 50-45. Fenerbahce trimmed that lead immediately with Batiste’s fine move inside and McCalebb’s steal and breakaway dunk to make it 50-49. And Onan’s three-ball evened it at 52-52 before McCalebb again snatched a ball and went the length of the court for a layup and a 52-54 lead. 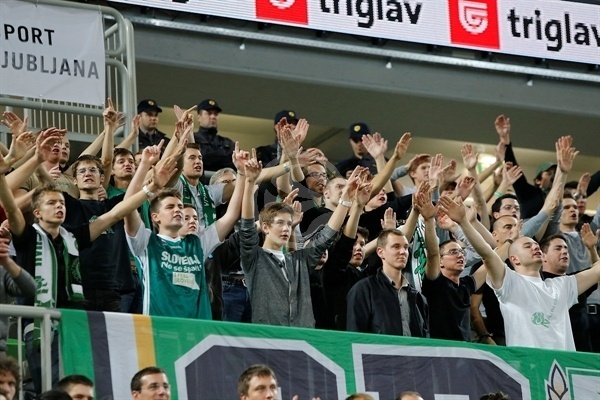 Baynes returned and scored inside and Blazic got out ahead for a reverse layup and a 56-54 Olimpija advantage. Fenerbahce bounced right back with Bogdanovic and Onan both converting driving layups for a 56-58 Ulker lead. Page’s dunk on the break proved to be the last tie of the quarter at 58-58. Onan hit a baseline jumper and Oguz Savas made a fine move inside for a 59-63 Fenerbahce cushion, which Muric cut to 61-63 with his layin off the glass. And that was the score after three quarters. Prepelic and David Andersen started the fourth quarter by swapping three pointers before McCalebb hit a layup. The star however was forced out of the game at that point when he landed awkwardly on his left ankle and did not return. Omic scored inside and Prepelic nailed a mid-range jumper to even the game at 68-68 before Baris Ermis came off the Fenerbahce bench to nail a triple from the right side for his first points of the game to make it 68-71. He later split two foul shots for a 68-72 Fenerbahce advantage. Prepelic and Baynes both failed to convert inside and Ermis nailed another triple for a 68-75 Fenerbahce lead. Baynes offensive rebound put-back trimmed it to 70-75 but Onan hit a layup and Preldzic made a foul shot for a 71-78 lead. Prepelic stole a ball from Onan and nailed a three-pointer to cut it to 74-78. Onan and Bogdanovic both made just one of two foul shots but Blazic also split two foul shots and Baynes missed a layup attempt with 12 seconds left and Olimpija trailing 75-80. "I want to congratulate Fenerbahce for the win. We were close, but to win against a team like Fenerbahce you have to be patient. They aren't in top condition yet, but they won because they were more patient than us. We kept high concentration for 35 minutes of the game, but in the last five minutes we made a few stupid mistakes and rushed decisions that cost us the win. I can't say anything bad about my team. They gave their all today. They need to gain experience and this comes with time. I would like to say thank you to our fans who came to the arena to support us, they were great." 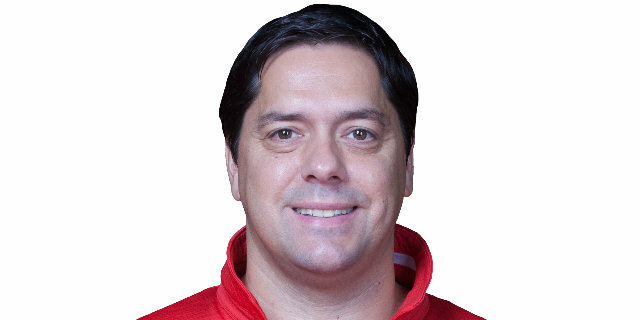 "I am very happy that we won and am very proud of my players. This was a very difficult win for us. We entered the game without Sato and Peker, who was sick. We had foul trouble from the beginning of the game and we also lost McCalebb in the clutch moments of the game. Other players stepped up and sacrificed everything today. We gave 110 percent to win this game. In next games, we will have to be better in critical moments of the game. We have a new team and again, I have to say I am proud of them that they pulled off a win today." "This game was very difficult for us. 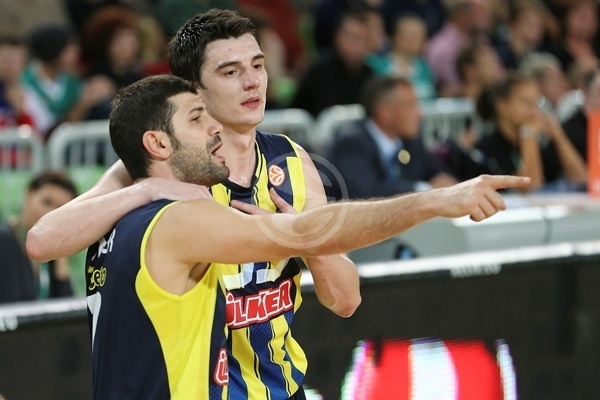 Any time you play on the road in the Euroleague, it is very difficult. We are happy that we won and we have to build on this road game. It is my personal opinion that our group is the toughest of all and and every point counts. Every win on the road is a blessing."